When I first came across sketchnoting, I knew it made sense fo education and teaching. The idea of “better notes” that helped students retain information better seemed like a no-brainer. However, sketchnoting was born from conferences and most modern teaching methodologies don’t treat learning like listening to a lecture and taking note. Instead learning takes place from interacting with information and a group (referring to Vygotsky and Piaget’s theories). As such I wondered how sketchnoting might look within a more modern teaching methodology. How could we use sketchnoting in principled ways. So I started to wonder about the stages of learning and a lesson and why you might use sketchnoting. So here are some ideas how you can sketchnote throughout the learning process. Often lessons have a period of preparing before engaging in new material. This is to activate pre-existing knowledge so that we can place new information within pre-existing mental frameworks. It also allows the teacher to identify weaknesses and strengths of the students in the class. Finally, we can also motivate students by generating interest in a topic. Sketchnoting can help students graphically show their knowledge, it provides an easy to check record for the teacher, it’s also proof of work so you know the students are on task AND drawing can be motivating for students and so helps generate interest. Mindmaps have long been used for this purpose. The original use of sketchnoting was to record details. However, this doesn’t have to just occur from a lecture. We can record data from a whole lesson to note our learning. Or we can record notes from books we are reading, experiments we conduct or projects we make. As a teacher, we can provide guidelines for the students to follow along with (with areas set aside for certain information or tasks) and then invite the students to customize as they wish. A simple language teaching example is the “emerging language framework” this is where there you divide a piece of paper into four sections. One for new vocabulary, one for new grammar structures, one for idioms or collocations and one for questions the students want to ask. It’s good to get students to demonstrate learning as it helps them notice their progress as well as being a skill in and of itself. Presentations, posters, essays and more are common approaches and sketchnoting can be used for all of these. A sketchnote could be used to present from, a sketchnote could be turned into a poster, and a sketchnote could help provide the outline for an essay. Alternatively a sketchnote could be the final proof of work where the student can show their learning. Even if the final output is spoken, the sketchnote can be used to guide their spoken words. Have you got other ideas? These are three simple ideas I had but there may be more. 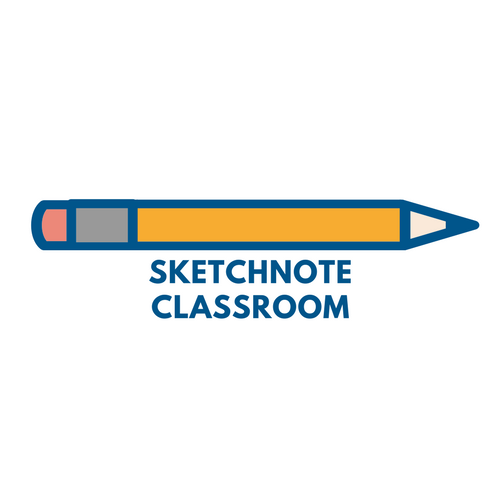 Can you think of any other stages of learning where sketchnotes are useful? Have you got any other activities to use sketchnote in.